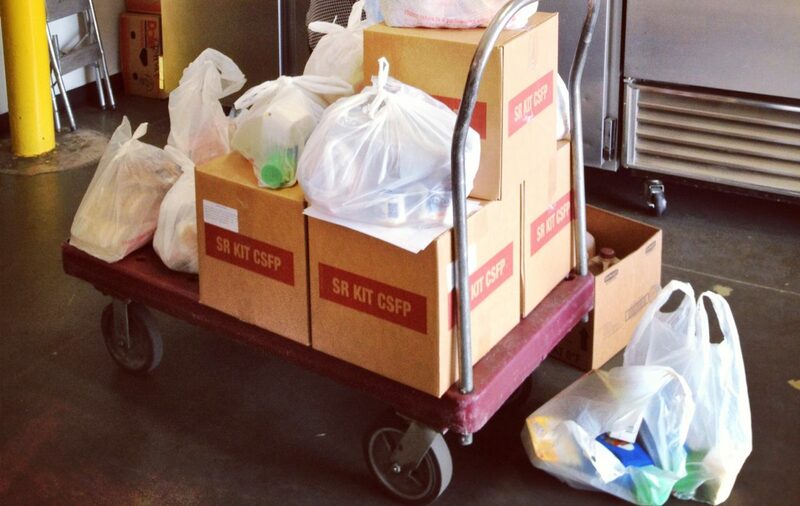 Volunteers help us deliver food to homebound people with disabilities and seniors. Interested in volunteering to deliver food boxes? Utah Food Bank provides free, monthly food assistance to homebound people with disabilities and seniors living in poverty, delivered right to the client’s home. Each food box contains approximately one week’s worth of non-perishable food, plus as much fresh food as available. Last year, 10,049 of these food boxes were delivered—primarily by caring volunteers—who were often some of the few visitors these clients received. Utah Food Bank is often the recipient of “luxury” items such as fresh flowers and even pet food that, when delivered, make life just a little nicer for these homebound clients. If you are interested in finding out if you are eligible for this program, please contact our Food Box Coordinator at (801) 887-1271 or foodbox@utahfoodbank.org. Each box contains approximately one week’s worth of non-perishable food as well as additional bread, fresh produce and protein items when available. For many recipients, the monthly volunteer delivering their box is often one of the few visitors they receive, offering a bright spot in their difficult lives. By signing up to become a Food Box volunteer, you can truly make a difference in the life of a fellow Utahn in need. Food Box Volunteers are required to deliver to a minimum of three clients per month for a minimum of six months, all located in Salt Lake County. Utah Food Bank’s staff will do their best to match volunteers to specifically requested areas as they are available. Delivering food boxes can be a great family volunteer activity! However, to ensure the comfort of our clients, we ask that the participating adults make the first visit without children to obtain the client’s permission prior to having children join you. If you are interested in a one-time delivery, please click here. We require a 6-month commitment of 3 deliveries per month. Prior to delivering boxes, volunteers must complete a short orientation at Utah Food Bank. Drivers must be 18 years of age or older. Each volunteer 18 or older must complete the application, regardless of whether they are driving or not. Please call clients monthly to arrange delivery time. Boxes are required to be delivered between the 1st and the 25th of each month. Deliveries must be made Monday – Saturday (no Sundays or holidays). All boxes must be personally delivered and may not be left outside the door. You are required to provide proof of car insurance and valid driver’s license. You must use your own vehicle for deliveries. We recommend that deliveries be made by at least 2 people. If you have additional questions please contact our Food Box Coordinator at (801) 887-1271 or foodbox@utahfoodbank.org.